Are the NE555 and LM555 chips interchangeable? Is this any noisier than the other pumps? I'm building a delay that requires ~35mA at 18v. Could two of these be put in parallel if higher current is required? I have no idea if that would work. Sorry..
Can i use this doubler with a 9v battery or only with a power supply ? would this work with 12V to give out 24v? how many mA? Verified. w/ a 9v power supply reading at 10.4v I ended up with 20.5v at the output. Very low noise also... I ran out of DC jacks and had to wire the output directly into an OCD clone to test out in circuit but I don't see it having any affect on noise going through the jack to jack route. I recommend this one to the ICL7660 pumps as its the same quality at a fraction of the cost.....I got my NE555 stock for $0.14 a piece. Cheers Adam! I'll tag it. is there a compact way to apply a voltage doubler and an inverter to get +/- 18V (for an EHX equalizer) from a +9V power supply? thank you! Would this pump fit into a altoids tin or something of similar size with 2x 2.1mm jacks? I'd love to stick this into something crazy small to velcro it to the under side of one of my pedal board rails. Check your layout and wire connections. The 9v rail is right next to the 18V rail, so be sure you grabbed the right rail. Does anyone have the Schematic? I do like! This might be a silly question but... Is it possible to incorporate a sag pot on this? I'm looking for something similar to Beavis Audio's Devolt (or whatever it's called), but I'd love to be able to start at 18v for a couple pedals. I can definitely just add the sag after this circuit, but I was wondering if one of the resistors could just be replaced with a pot to keep the size down as I might have a few of these on my board. Thanks! I added a 1M pot on the end, lugs 2/3 linked for the input, with lug 1 being the output. Got my 18 variable down to 9, you could use 2 meg pot to take it down to about 4-5v. I'd like to power a pedal to 18 volts maximum (an univibe); is this charge pump ok for this? I've red that arrives to 24 volts....can I get down this value in any way? What an amazing and useful site. IvIark deserves a tech Grammy. I have built three of these voltage doublers. Two were fine; the third one is doing that high-pitched-whine thing. Only happens when I switch to 18v - I have the doubler on a DPDT. Everything about the build, and the pedal it's in, is essentially the same as the last two. I've tried: replacing the 555; going over all soldering, channels, etc; adding decoupling cap and resistor at the positive input, moving the whole unit around.... nothing changes it. The incoming power supply is a One-Spot, and I've used two other adapters, not daisy-chained. The voltage out is correct -- around 17v or a bit higher. Used 1N4001 diodes. Is there any other possible fix or should I toss it into the Box Of Inexplicable Weirdness? I would like to resurrect this one a bit. I put this on a breadboard and love the results. No whine so far in my audio path. I also put two 1n caps in series and doubled the frequency. Should this be a problem? I'm also trying to keep the big electrolytic cap sizes down. I'm using a 100uf 25v for the main 9v supply. Can I lower the 220uf caps any? I figure I should run the 220u between 18v and ground at 35v, but can I lower it to 100u as well? The one off pin 3 is the cap being charged by the square wave out of the timer, correct? Can I lower that to 100u, too? I'm going to try modifying this to run closer to 27v. 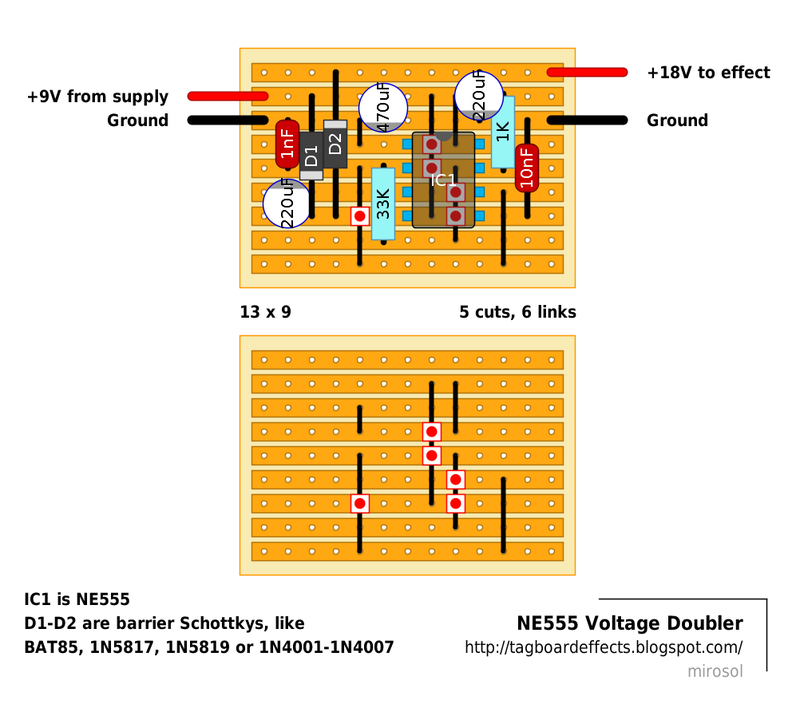 I see a schematic that multiplies the supply to approximate 3 times the original voltage. It uses much smaller electrolytics (10uf), but I assume the aren't considering audio power supply applications.